Do you think Eric Packer is the most stylish character you've ever created? Actually, I think Dr Jung in A Dangerous Method was pretty darn stylish. There is a contemporary quality to Eric that is certainly timely and cutting-edge in that sense. On the other hand, he's a guy who, like a lot of the financiers that we read about now, the "London Whale" being one of them, really want to be anonymous. They don't want to cut a great figure in the public eye. Part of their power as investors is anonymity and so although Eric Packer does have a bodyguard in this movie, the bodyguard is there to protect his life, not keep the fans away. What's been your worst date? I never really dated. The thing is I've been married for about 37 years and it's kind of a strange thing because I've never done this tradition of dating and pick-up lines. Somebody in Berlin said, "What's the worst pickup line you've ever heard?" I said, "I've never given one, at least not consciously". Rob said his answer for that is "I would look good in your clothes". I thought that was a pretty good one. Catherine Bray: Hello David. I should start by saying I really loved the film, having seen it twice now, at the premiere in Cannes and on coming back to London - it’s a really extraordinary piece of work. David Cronenberg: We should stop the interview right now, we can’t do better than that. Catherine Bray: [laughs] Maybe we can start off by talking about Eric Packer, who I think is such an extraordinary character, for which your casting of Robert Pattinson was such a smart move. 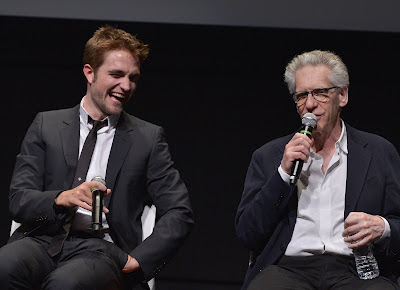 David Cronenberg: Well, as a director you have a lot of balls to juggle, just with casting the main character and something that’s obvious, I suppose, is that you have to have an actor whose fame will support your budget. It’s kind of mundane and it’s not really part of the creative process, but it is part of the pragmatic process of getting a film made, so you need somebody who financiers and financial people and investors can get excited about and obviously Rob has that. But beyond that, when the smoke clears you’re left with you and the actor on the set, and whether he is good or he's not good - is he the right guy or not? - and that’s something that as a director you can’t lose sight of. And having looked at a lot of the things that Rob did, particularly the Spanish movie called Little Ashes in which he played the young Salvador Dali, I thought, 'this is a really interesting and serious actor who’s not afraid to play some very difficult roles', and so it proved to be. Even Twilight and so on let me know that he could do the accent that we needed for the movie, that he had the charisma that you need if you’re doing a movie in which the lead character’s in absolutely every scene. There’s no scene that he’s not in, so you need someone who’s incredible watchable, and we all know Rob is that. Catherine Bray: And there’s a really exciting tension between his kind of persona in the film and his public persona, the idea of someone being at their peak deciding to go another way. David Cronenberg: Yes, and the character himself is a kind of enigma. It's something that is becoming more and more familiar - someone who is incredibly capable on one level, in this case financial wizardry, and completely inept on the level of human interaction. It seems to go together a lot these days, and we’re just discovering more and more people who’re like that.